Muhafiz Gardens Islamabad has announced last date of registrations and all those who want to be part of the scheme can submit their registration forms along with 10,000 registration fees in all nominated branches of JS Bank across the country by 26th June 2015. Registered members will receive special discounts from 1 lac up to 4 lac rupees at the time of booking of plots and apartments in the project. 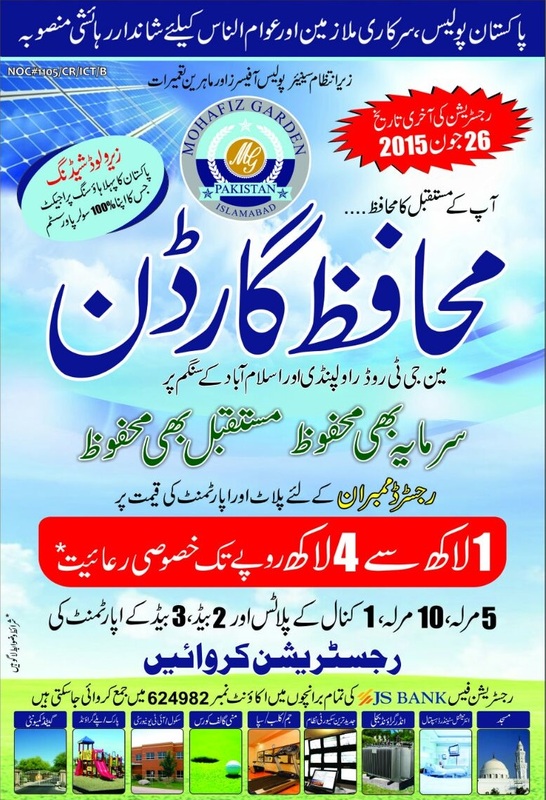 Muhafiz Garden Islamabad is launching its registration forms from 2nd of June 2015. 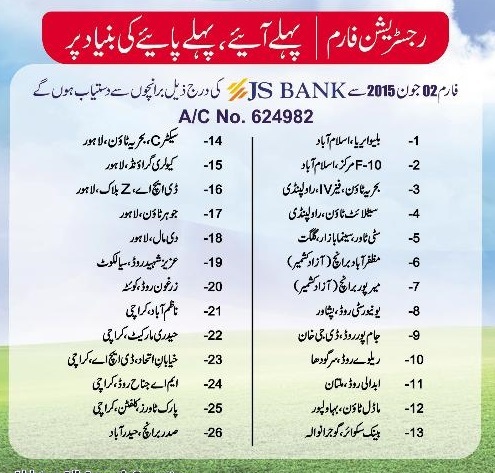 Forms will be available from designated branches of JS Bank across the country. Forms will be available on first come first served basis, so you need to rush to your nearest bank in the morning so that you can avail this opportunity. As soon as registration forms come out, trading will increase and prices may go up further. 10% dealers quota is reserved which is available in the market and forms will issued by and submitted to same authorized dealers. 10 thousand registration fees will be submitted along with the form. The project will consist of 5 marla, 10 marla and 1 kanal residential plots as well as 2 bedrooms and 3 bedrooms apartments. There is still no information disclosed as to the location of this housing scheme, however this project has created much buzz in the property markets in Islamabad, Rawalpindi, Lahore and Karachi. Muhafiz Gardens Cooperative Housing Society has begun to officially advertise its upcoming project “Muhafiz Garden Islamabad” on print media. The location as mentioned on the advertisement is somewhere on GT Road but no specific details are given yet. NOC has been acquired from CDA and the noc number is NOC # 1105/CR/ICT/B. Further details about the society can be acquired by calling the phone numbers given on the advertisement. An advertisement has been published regarding Muhafiz Gardens Islamabad, and we have come to know few concrete details as mentioned on the advertisement. The project is sponsored by Muhafiz Garden Cooperative Housing Society Islamabad, which has its headquarters at I&T center G-10/4 Islamabad. The Society is supposed to be located somewhere at the junction of Islamabad and Rawalpindi, however exact location is still unknown. The society is claimed to be headed by Senior Retired Police Officials, and the President of the Society Mr. Chaudhry Shahid Iqbal is an Ex- DIG of Police. No specific dates announced as to the official launch of this housing scheme or commencement of registration process. So, the misconceptions regarding authenticity of the scheme are very much dispelled by this official advertisement. This is a Coming Soon type of advertisement, which means it is going to take another few weeks until the project is officially announced. 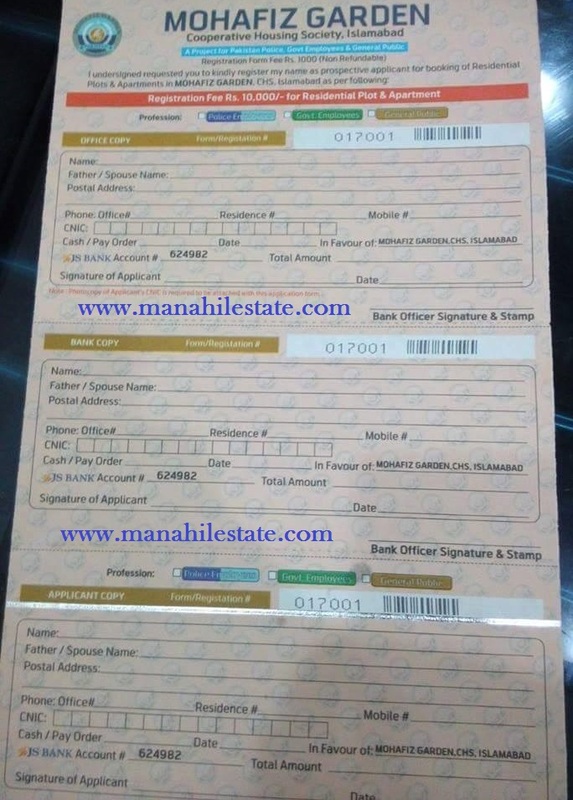 Registration Forms of Muhafiz Garden are available in the market, however the society have not announced to have authorized any entity to indulge in trading of these registration forms. Still, there might be some close linkages of some entities who have started trading of these forms in Islamabad, especially in the bazaar of dealers in Bahria Town Rawalpindi. There is nothing available regarding this housing scheme from any official channel i.e. official website/newspaper announcement etc but as per the hearsay information from dealers trading in forms, the scheme is going to be officially launched within next 10 days. Location would be the most important factor setting worth of this launch, however background of the sponsors would play vital role when it comes to trading. 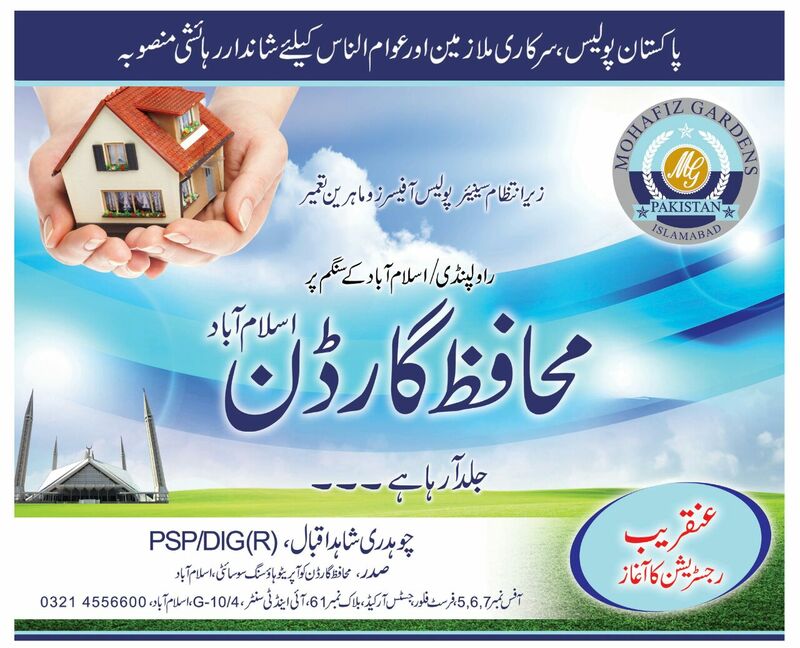 As per further updates received regarding this housing scheme, the project is NOT sponsored by Pakistan Police and it is offering residential plots as well as apartments. Registration fees of Muhafiz Garden is Rs 10,000/- which should be submitted along with the registration form. There seem to have been reserved specific quota for Police Employees, Government Employees and General Public as you have to mark your profession while filling out the form. Muhafiz Garden Form Prices tend to escalate after the official announcement of this project which is expected within a couple of days. Since the project is coming from a sound background and offering residential plots and apartments, a great deal of investment is expected in this project from local public as well as Overseas Pakistanis who are always looking forward to such investment opportunities. This public notice has been issued by National Police Foundation on Daily Nawa-e-Waqt Newspaper regarding Muhafiz Garden Housing Scheme. The notice reads that the foundation has not launched any housing scheme anywhere in Islamabad or Rawalpindi by this name, and dealers involved in the registration of Muhafiz Garden while associating this society with NPF are misguiding the general public. There are few dealers who have used the name of NPF to sell out forms, however some are using the name of Pakistan Police Foundation, which is an unknown entity. So, it is quite evident that it has nothing to do with NPF, instead it is a different body altogether. We will update this page as soon as more information is available regarding Muhafiz Garden Islamabad.